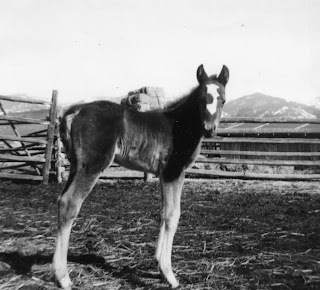 The newborn filly had an unusual marking on her face. as shown here with her impatience during tying lessons. She also had interesting ways of entertaining herself. She’d often toss her grain tub into the air or fling the water hose over her head just for fun, if it was ever left within her reach. She beat on her water tank with a front foot if it wasn’t full enough to suit her. I had to use a metal tank because she thought rubber tubs were just for playing soccer. Sometimes she’d take the top strand of fence wire in her teeth and pluck it like a banjo string, just to hear the sound it made. Fahleen was very bold and curious. 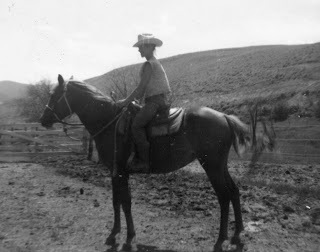 When she was young, there was only one electric wire separating her part of the pasture from our hay fields. If the electricity went off, she immediately knew it and walked over or under the wire. 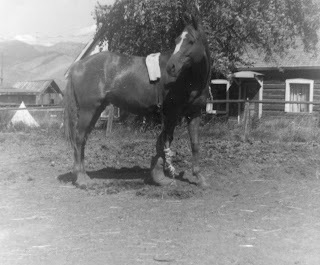 She wasn’t afraid of anything and would walk out on the ice-covered creek in the winter without hesitation, something none of our other horses would do. Fahleen and me during the first summer I was training her for riding. Her boldness sometimes got her into trouble. One of her worst tricks was trying to open gates with her front feet. When she was 4 years old, she got her foot caught in a gate, and by the time she pulled free, she had injured the joints in her lower leg. The leg swelled up as big as a fencepost, in spite of the cold water and ice I soaked it in (using a tall homemade soaking boot created from a rubber inner tube, held in place with a leather strap over her back). She could hardly walk for several days. I had to lay her off for the rest of that riding season. The leg healed, but the pastern joint fused as it healed, leaving the joint solid (no movement) and with a calcium lump on the side of it. When I started riding her again, I discovered that the fused pastern joint made the action in that leg a little different. Not only was there limited motion in the pastern, making her stride a little shorter on that leg (and hence making her land harder on the good leg), but she no longer picked that foot up straight. It broke over to the outside (instead of the center) of the toe, and then because it took more effort to break over (due to the fused pastern joint), the leg had an exaggerated swing, creating a twisting motion that brought the foot inward instead of outward, as a foot would normally do when breaking over to the outside. kept ice water on her leg for the first 24 hours after the injury. 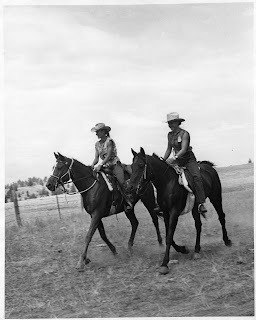 I rode her a little that fall, checking and moving range cattle, then used her to round up the cattle off the range in late fall, which entailed several days of long, hard rides. Even though she wasn’t lame, she was often hitting her good leg with the crooked-moving foot. We had to find a way to shoe her so she wouldn’t strike herself. Since I’ve always done my own shoeing, my husband and I experimented with corrective shoes, because Fahleen was getting a sore fetlock joint from bumping it so much. We finally figured out a way to shoe her that solved the problem. Lynn made a square-toed shoe and welded a dab of borium (hard-surfacing material) on one side of the toe — on her off-to-the-outside breakover point. This forced her to break over the center of the toe instead, making her pick up the foot straight. Hence it traveled straighter in its flight, without the added twisting motion, no longer hitting the opposite fetlock joint. This resolved the interference, and the open sore on that leg healed up. I started riding her again a year after her injury. But she had enough other problems to keep me frustrated. Her digestive tract was very sensitive, perhaps from early worm damage as a young horse. 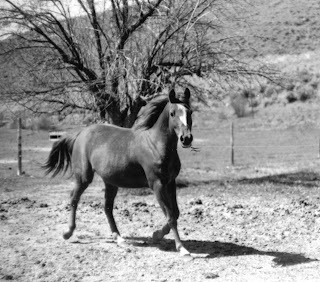 She was the first of my foals born on this ranch, the spring we moved here after Lynn and I were married. The pasture where we kept Nell and her foal had been used for decades by horses of previous owners and was probably heavily contaminated with worms. Those early ranchers didn’t deworm their horses. 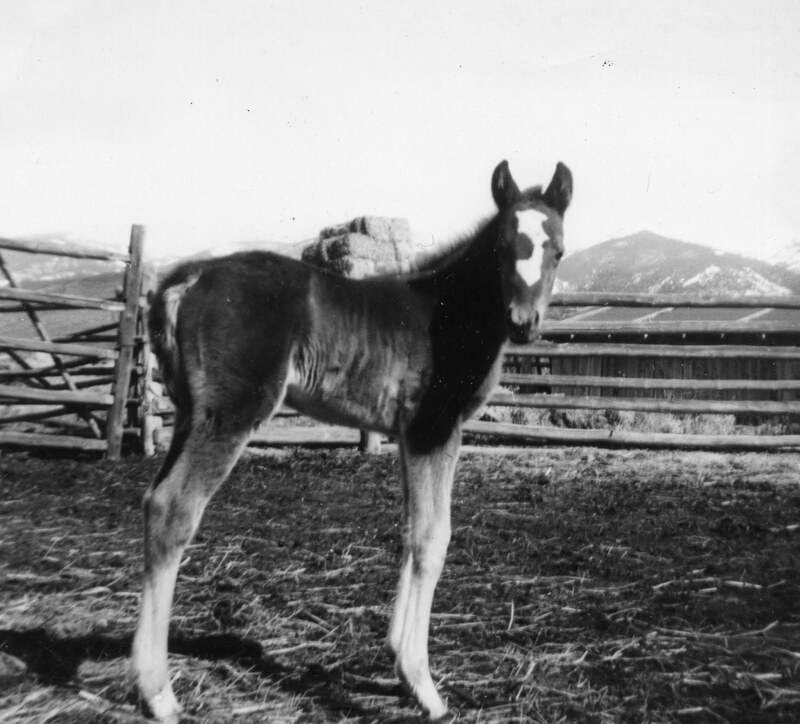 Deworming was a relatively new thing in the early 1960s, and even though we tried to keep our horses dewormed, the ones at pasture probably were continually reinfected — and a foal wouldn’t have as much resistance as the older horses. all our range riding and cow checking. 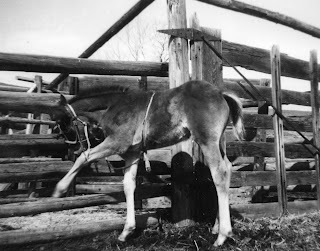 Fahleen had a tendency to colic readily, so I became very careful about her feed and water. 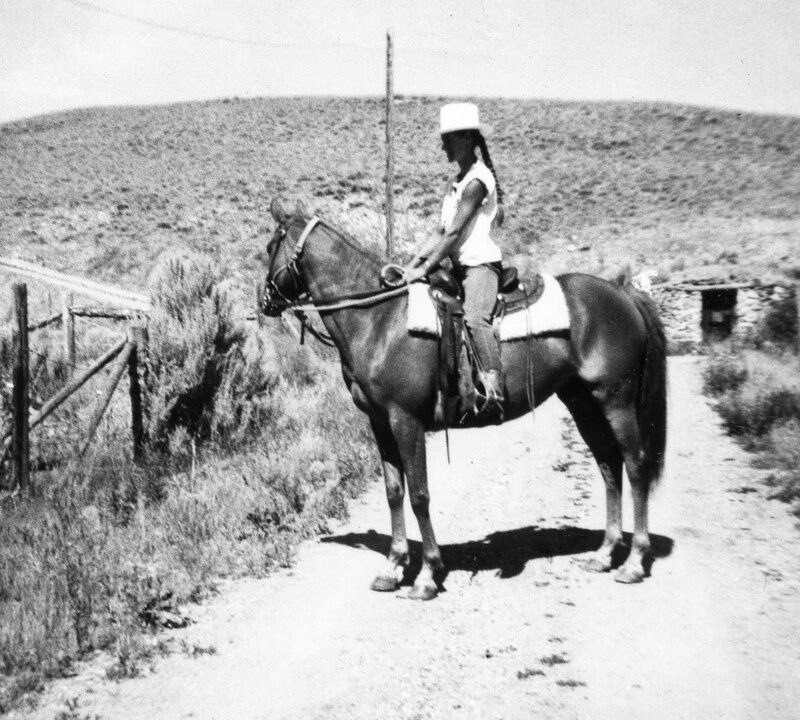 I always limited the amount of cold water she drank while working hard, even though a horse needs to drink a lot of water during a day’s work on the range to keep from becoming dehydrated. 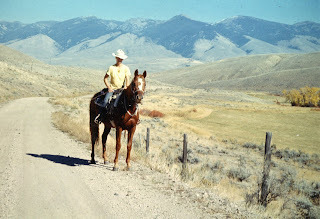 I learned the hard way about her extra sensitivity after she drank from a cold stream in the mountains one hot day when I was searching for stray cattle. Even though I limited her intake to about 12 swallows at a time and spaced her drinks out over several different stream crossings, she began having gut cramps, wanting to roll. I had to lead her home 10 miles, wearing holes in the soles of my old boots. I also discovered that she couldn’t tolerate grain. If she was fed grain on days I rode her, she was more apt to have colic problems. By trial and error I found that she did much better without grain, except for maybe a handful of grain early in the mornings. 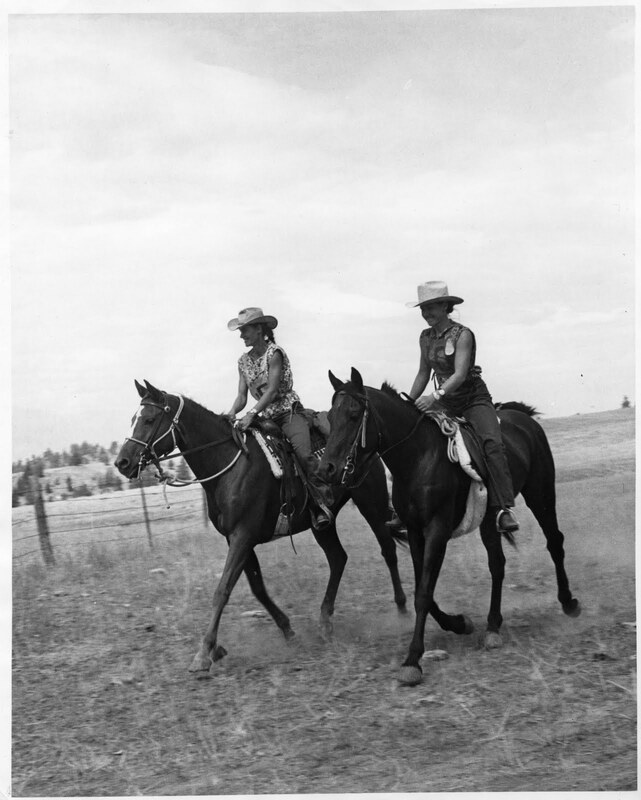 She stayed fit and in good condition on good hay, even during our hardest distance-riding campaigns. Since she was in such good physical condition from all our range riding and cow checking, I rode her on several endurance rides during the early 1970s, and we did very well. 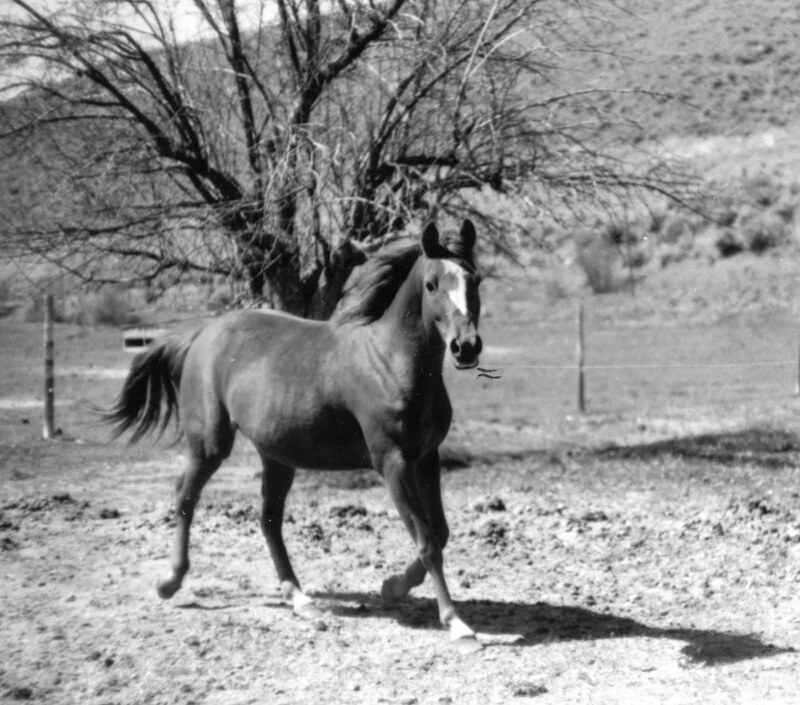 She loved to trot, and we could go miles and miles at a trot without tiring. 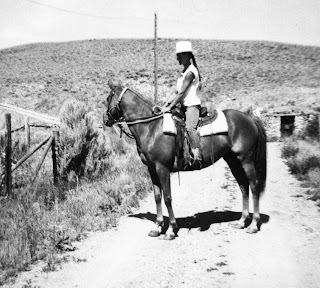 Her exuberance was contagious, and it was a thrill to ride her. I hoped to compete on many rides with her, but that dream was tragically cut short. and we could go miles and miles without tiring.